Want To Find Out The Theory? There’s no one right ‘answer’ for the ideal training programme. Instead we’re going to be pragmatic. The aim here is to get something down on paper (or electronically), that you can work through, adapting and tweaking as you go, but generally keeping you on the right path towards higher fitness. The process that I outline in this post uses the methodology set out by Joe Friel in his magnificent tome, The Cyclist’s Training Bible. Friel’s approach is based on the widely-accepted principle of periodization (yes, with a ‘z’), developed by Soviet and Romanian sports scientists in the 1950s and 60s. I like to think of myself as Joe’s unofficial Padawan learner in the ways of the Force training theory (‘unofficial’ since he is unaware of my existence). If you want to know more, I recommend you purchase a copy of said book. It’s a bit heavy-going at times for the recreational road cyclist (hence why I try to offer the some of the key points in posts like this one), but the book really does live up to its name – just with a bit more scientific evidence ;-). 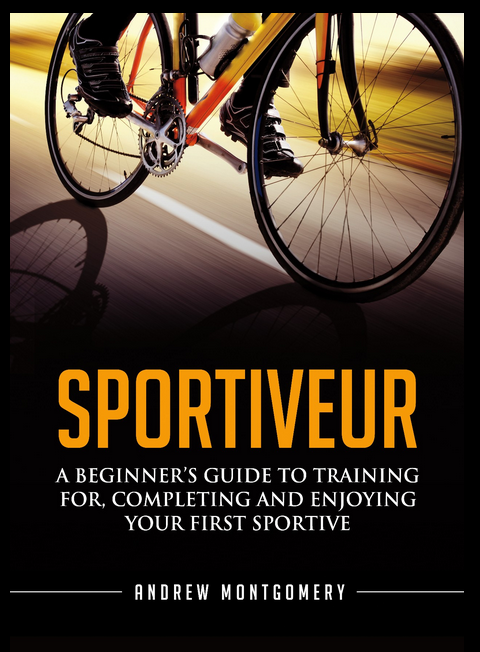 Click here to view The Cyclist’s Training Bible on Amazon UK and click here to view it on the Amazon US site . Get the paperback version, rather than Kindle, even though the price is a bit higher – there are a lot of tables and charts that are best read in the larger book format. You’ll need either a pen and paper, or a spreadsheet on your computer. To avoid repetition in this post, I’ll just explain how to do it using a spreadsheet. I use Excel, but Google Spreadsheets will do just fine. Everything can be replicated easily using the pen/paper route (there are no formulae) – it’ll just take a little longer to write everything out and may involve some messy scribblings as you play with dates and period lengths. Once you’ve arrived at a plan you’re happy with, you may want to copy out a clean ‘final’ version (…bearing in mind that there’s never a final version…). You’ll also need some way of checking dates (or be really good at working it out). So your computer or phone calendar/diary (or the physical one you attach to the wall/keep in your pocket). For your annual plan, you don’t need to specify individual sessions. The smallest time increment we need is a week (which, if you remember from this previous post, is known as as a microcycle). So start the process by opening a new worksheet and finding row 3. Starting at cell C3 and working horizontally, enter the numbers 1 to 52 into each cell on that row (so cell C3 contains “1”; D3 contains “2”, E3 contains “3”, etc). Each of the numbers you added above corresponds to a week over the course of the next year. Week 1 is “next week”, whatever that might be for you. I’m writing this post at the end of October, which is a good time to be doing this annual planning exercise (in the northern hemisphere at least). My week 1 starts on Monday 3rd November 2014. For purely aesthetic reasons (I do like an attractive spreadsheet), I separate the months (which I enter on row 4) and the ‘day’ dates (which go on row 5). In row 5, enter the week commencing date (i.e. the ‘day’ date of the Monday of that week) below each of the week numbers in row 3. Now we need to fill in what we’re going to be doing in each of those weeks. One of the primary purposes of creating a structured annual training plan is to give you a roadmap to your desired fitness destination. A mangled metaphor perhaps, but one that highlights that your training plan needs to be focused very much on the end goal: the date at which you want to be in your highest possible level of fitness. So the first thing that needs to go into the plan is the date of your target event. Let’s say that you want to peak for the 2015 RideLondon event. This will take place on Sunday 2 August. In cell B23, type ‘Race’ (or ‘Event’ if you want to be slightly more truthful). Then, scoot across to column AP and change the background colour of cell AP23. Since you’re planning to work hard in training in the run up to RideLondon (why else would you be planning a training programme 9 months in advance? ), you’ll need a good taper period of two weeks. 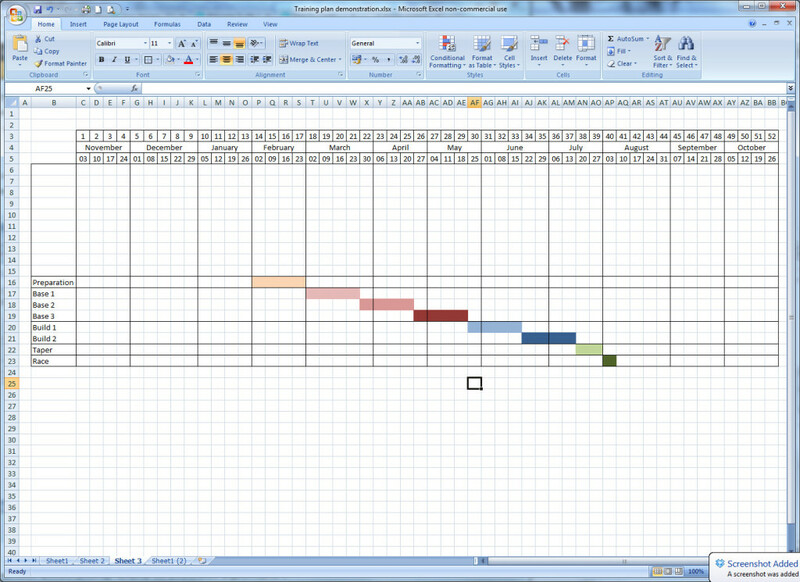 In your spreadsheet, move up a row from the ‘Race’ line. In column B on that row (so, cell B22), type ‘Taper’, then move across to the columns that represent the two weeks prior to RideLondon (weeks commencing 20 July and 27 July). 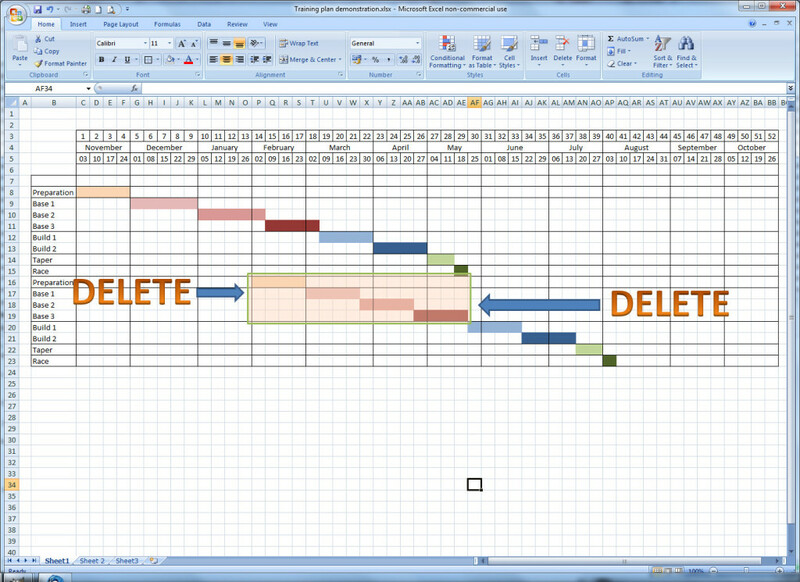 In those cells on your ‘Taper’ row, change the background colour to denote that those are ‘Taper’ weeks. 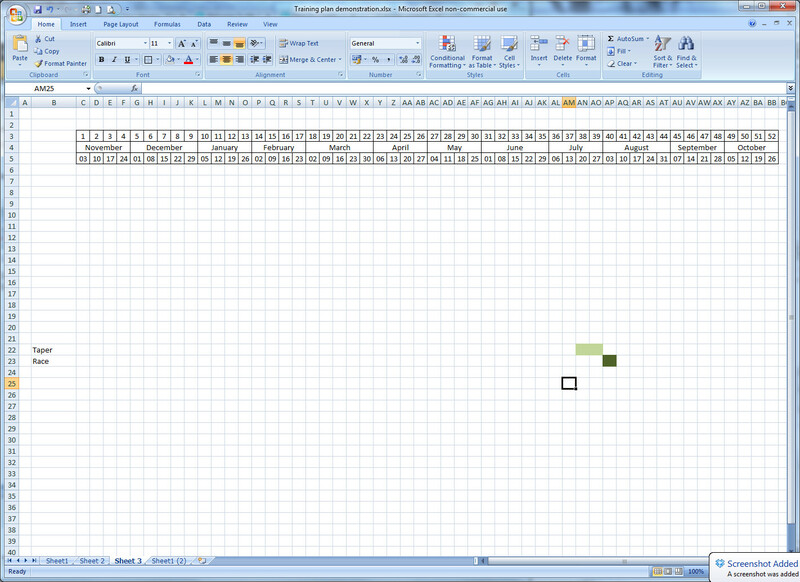 In my demonstration spreadsheet, these are cells AN22 and AO22. We’re going to keep working backwards, adding training blocks to fill the time between the event/taper period and now. 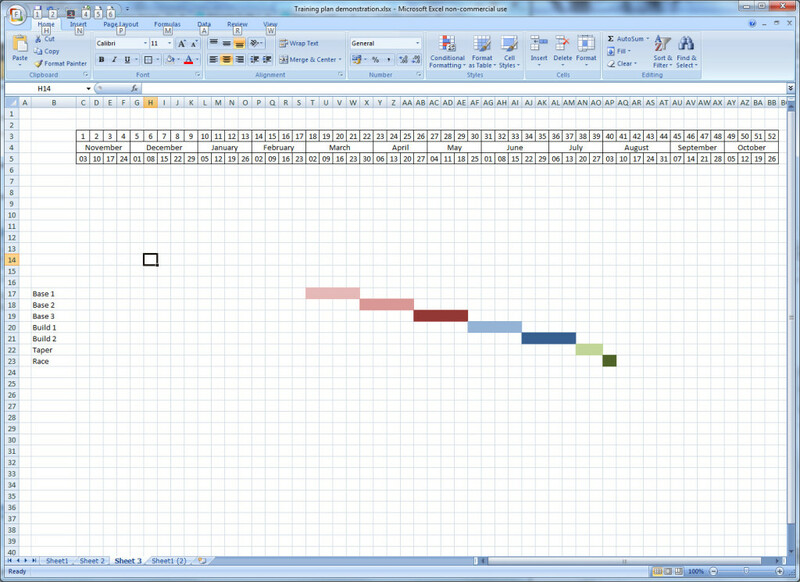 In the row above (row 21), type ‘Build 2’ into cell B21. For the sake of argument, let’s say your Build 2 period will be 4 weeks in length (Build 2 is a mesocycle). So, for the 4 weeks preceding your taper period, denote in the relevant cells on row 21 that these weeks belong to Build 2. In our RideLondon plan, these are weeks commencing 22 June, 29 June, 6 July and 13 July. 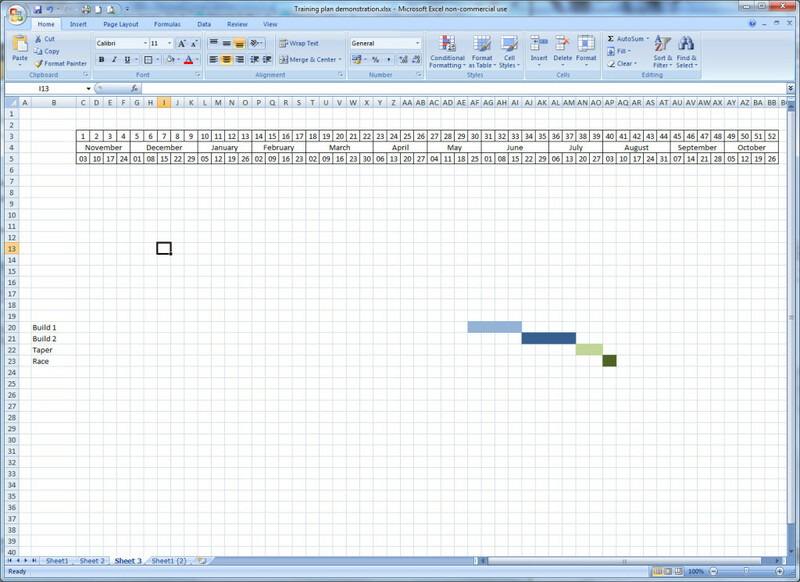 Move up a row (row 20) and type ‘Build 1’ in cell B20. Again, let’s make Build 1 a 4-week period. Move across to the appropriate cells on row 20 and colour in the Build 1 cells. The Base period of your plan should be longer (in time terms) than your Build period. In the example above, we used an 8-week Build, so let’s go with a 12-week Base training period. Twelve weeks is too long for a single Base macrocycle, so we’ll divide it into three 4-week cycles (cleverly named Base 1, Base 2 and Base 3). Still working backwards, enter “Base 3” into cell B19 and, staying on that row, colour in the cells for the relevant weeks (the four weeks before your Build 1 period). Repeat for Base 2, this time on row 18, and Base 1, on row 17. Base 1 is the first ‘proper’ period of our structured training plan. If you’re just getting into cycling, or you’ve had a break from the bike after a hard season of training (known as a ‘Transition’ period in training programme terms), you might want to start with a 4–6 week ‘Preparation’ cycle – a gradual process of reacquainting yourself with spending time in the saddle. In my screenshot, you can see the Preparation training block on row 16 (plus I’ve added in some nice lines to make things clearer to read). Hang On! This Training Programme Starts In Fugging February! I Want To Start Now! Good point. This is what happens when you’re too organised. Actually, there is a solution, and this is where it gets a bit tricky for me in presenting this post as a ‘How To’ guide for creating a training programme. There are hundreds (thousands? millions?) of programme permutations that you could produce using generally accepted training principles. Let’s continue with the ‘Peak For RideLondon’ example and hopefully you can draw some insights from that. So sticking with our principle of working progressively harder for a period of time, before taking a breather and then going again, we can introduce another, earlier, peak into our training plan. Following the first peak, you’ll take a short recovery period, before resuming the building process towards peak 2 (RideLondon). If you want, you can identify another target event to coincide with peak 1. We’re aiming to peak for RideLondon at the beginning of August, and ideally we want to precede that with a nice eight-week build period (Build 1 and Build 2), plus a two-week taper. We can always allow for a few more weeks between peaks by adding a little extra bass (ahem, I mean ‘base’). We therefore have a window from mid-April through to mid-May, which would be ideal to target another sportive. Now is probably the right time to acknowledge that we are not professional athletes. We are not members of the British Cycling world class performance programme, targeting gold in Rio. (If this is a shock to any of you, I’m sorry to be the one that had to break the news). Returning to our example, if you want to do a sportive in June and then do RideLondon on the first weekend in August, there is absolutely nothing to stop you. It’s highly unlikely that this will derail your training. You’ll simply play around with the plan, to do what you can to build fitness in the time available. The purpose of creating an annual training plan is to give you a general structure in which to fit each 4–6 week block of training, based on a notional date when you’d like to be at your fittest. It’s not meant to restrict you from entering an event you’re keen to do, simply because the dates don’t fit. If all else fails, and the event in question is not too extreme, there is no reason why you can’t do a sportive event as your Sunday long ride (for example) and either not taper or have a short taper period, accepting that you’ll have a bit more fatigue (and a bit less form) in your system than you will for your target event. So let’s pick a sportive in May. In a flash of county-ism (and not a little courage, given its difficulty level), let’s say I pick the Etape du Dales. This takes place on 17th May 2015. We’re going to replicate what we did above for RideLondon, but this time filling in the training blocks between now and mid-May. To be honest, we could start from the beginning of the programme and work forwards (Preparation then Base 1, Base 2, … , Build 2, Taper) but let’s do things properly (i.e. starting with the ‘destination’ in mind). We need to plot our new ‘Race’ week. This goes on the row above the ‘Preparation’ line in your original plan, and in the column for week commencing 18th May (cell AE15). Ignore for the moment that this week overlaps with our RideLondon training programme (week commencing 18 May was originally the last week of Base 3). We’ll deal with this double booking later on. 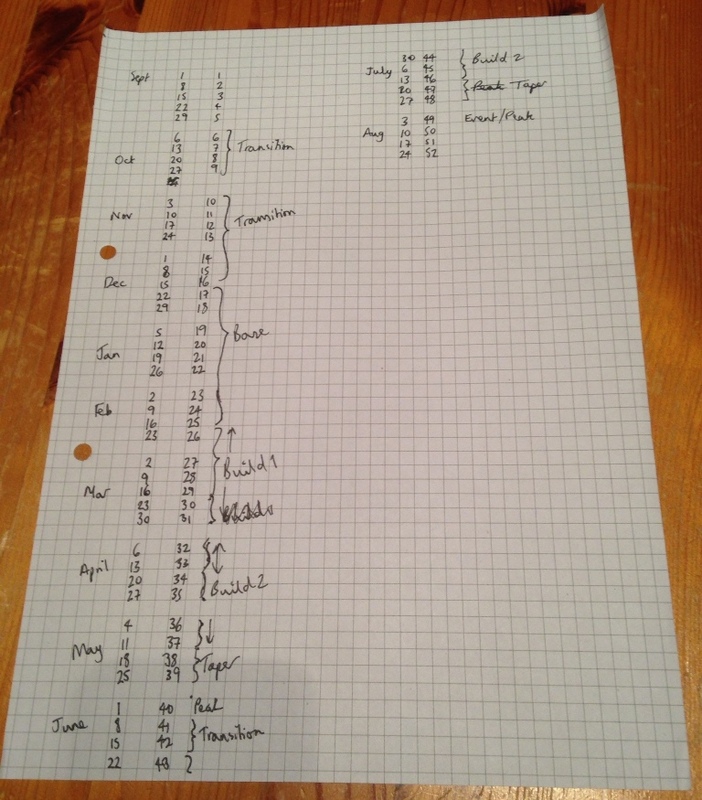 As it happens, the dates of Peak 1 (Etape du Dales) and Peak 2 (RideLondon) work out quite nicely. Having completed the Yorkshire Etape on Sunday 17 May, we spend the remainder of ‘Race’ week recovering. 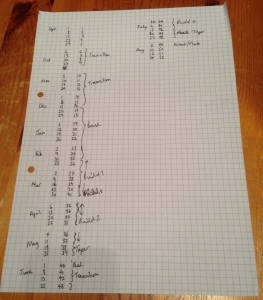 Then, looking back to our original RideLondon plan, we see that week commencing 25 May is the first week of the Build 1 period. We can simply revert back to the original RideLondon plan for the remainder of the programme. 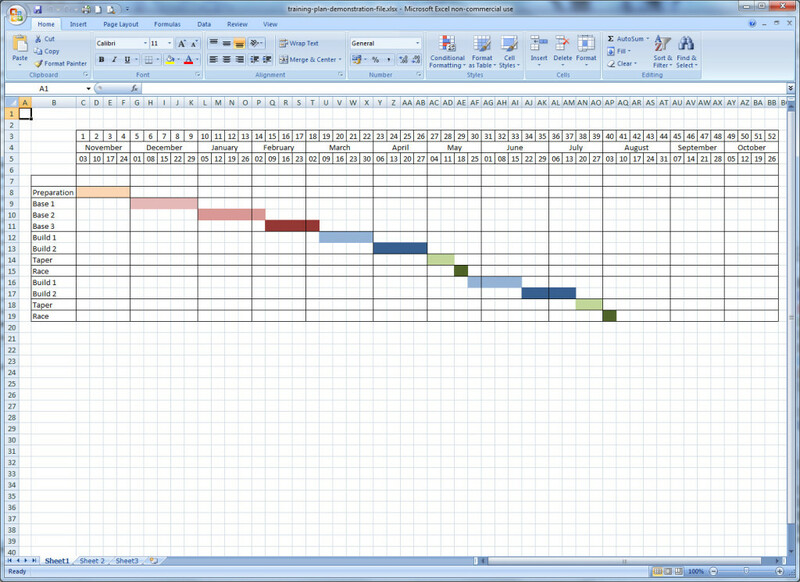 In spreadsheet terms, we simply delete the rows relating to the redundant phases of the RideLondon plan (Preparation, originally starting in February, through to Base 3 in May). I’ll leave you to choose what you do with your epic levels of fitness from August onwards. Do You Want The Excel File? Now it’s time for you to create your own training programme. 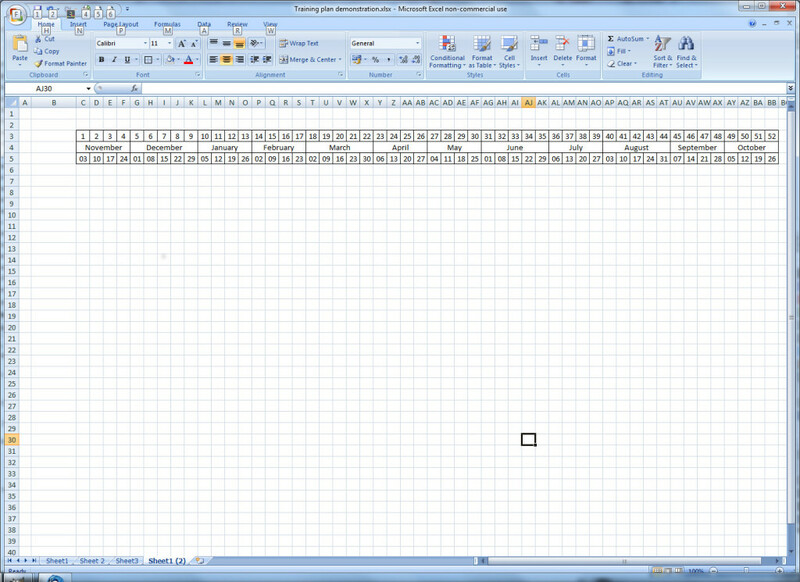 To help you, I’ve uploaded the Excel file that I used for the screen shots above. Click on this button below and you can download it to your computer. You can then copy, adapt and amend it to your heart’s content. All I ask is that you subscribe to the Sportive Cyclist by email. 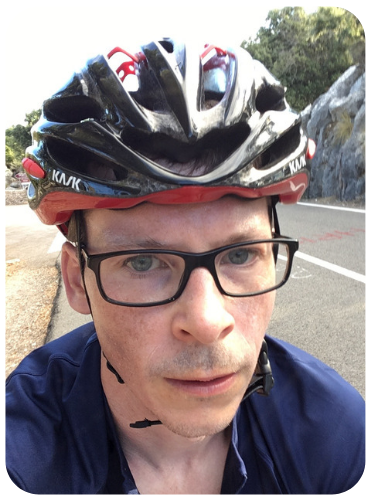 You’ll get a short email from me each time a new post is published on the blog, as well as access to my exclusive Sportive Cyclists Toolbox (more advice! more entertainment!). In order to become a subscriber, simply head to the ‘Subscribe’ page and enter your email address. Until next time, safe cycling! I think it’s also important to look objectively at how you are doing performance-wise throughout a training programme. After a few weeks see whether realistically your programme is too intense or not challenging enough and ensure that you can keep the programme dynamic so it’s always helping you reach your aims. If you have to change it so that it is – go for it. We’ve found gathering stats about your performance can be great to and we use a Watt bike as used by British Cycling which you can rent by the hour to gather useful stats. Good afternoon Monty, where have you gone? Pingback: What Is Strava Fitness And Freshness?